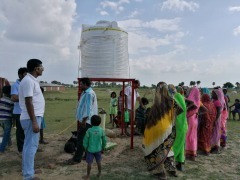 AMDA Peace Clinic in Bodhgaya (APC) has been providing various community health/social development services to the people of Bodhgaya in the state of Bihar since its launch in 2009. Since November 2016, AMDA has launched a primary healthcare initiative which is aimed at engaging local residents to improve their knowledge on health and promote their wellbeing despite living in destitute communities. The projects in Suripur village (located in the vicinity) have been supported by Ms. Veda, a former APC staff who currently runs an elderly nursing home. AMDA has also helped provide meals to the elderly people staying at her facility. 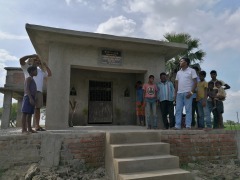 As part of livelihood assistance, AMDA recently built a bore well in the village of Suripur. The well was built to supply water to elderly households and to a fruit garden whose plan has been underway. Likewise, Tasho Isshinji Temple of Nichiren Buddhism decided to offer a gathering place to local residents where they can get together and offer prayers. Hinduism is indeed the pillar in their daily life and it was there ardent wish to have a place where they could enshrine Durga, a Hinduist guardian god that exorcise the evil. 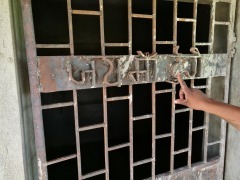 The idea came up during the discussion between AMDA and locals who wished to have such a facility. The construction was mainly undertaken by local residents from July to August, and further operation of the facility will be decided by the villagers themselves. AMDA will make a continuous effort to promote participation of local people to this initiative.